The Best of Teacher Entrepreneurs: Language Arts -"MEGA Bundle Packet of Reading Syllable Vowel Type Words with Word Lists and Games/Activities"
Language Arts -"MEGA Bundle Packet of Reading Syllable Vowel Type Words with Word Lists and Games/Activities"
The mega bundle packet includes 400+ words lists and 70+ games and activities!!! There are 6 syllable types in reading. The basic overall purpose of learning syllable type reading is to give students 6 reading strategies to aid them in chunking longer words into short, readable parts. Learning to read by identifying the type of syllable is the most consistent method to teach reading to your students, and the easiest way for your students to learn to read. All of the words lists incorporate patterns using all the vowels. The closed syllable and V-C-e syllable target words using common phonograms. This packet of activities and games give students a fun way to learn the syllable types. The activities/games can be placed in language stations, or they can be played during small groups. So enjoy as your students learn another way to break the code to reading! 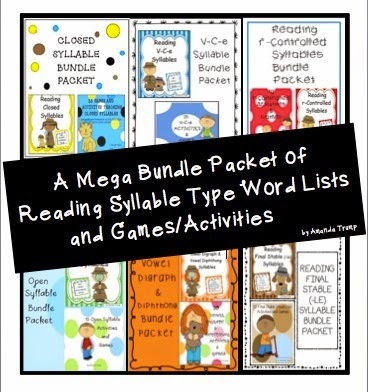 If you would like to preview what is in the packet, just click on my individual bundle packets for each syllable type to preview the materials included in this mega bundle. 6. First or Last Syllable Open? 2. Which Final Stable Syllable Sound? LANGUAGE ARTS - "PHONEME SUBTRACTION"
LANGUAGE ARTS - "Vowel Picture Sorts"
FREE MISC. LESSON - "FREE Tutoring Record Sheets"